If you have a few or all of your teeth are missing, or you are simply unhappy with your conventional denture one solution is to have an implant retained denture. The advantage is that the implants support the denture and stop it from moving around in the mouth. Another benefit is that having a stabilised denture removes the issue of dentures becoming loose and painful over time. 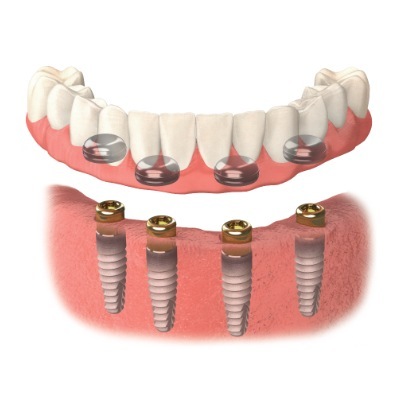 Implant retained dentures provide extra comfort as they will not fall or move around while you are talking or eating. Dental Artistry offers other conventional denture solutions. Should you need more information, do not hesitate to contact us and one of our treatment coordinators will provide you with further details. The treatment starts with an initial consultation to understand the process and options available, followed by a thorough clinical assessment. The assessments include taking the essential clinical photographs, radiographs (x-rays), CT Scan(if necessary to examine the bone), full mouth, gum and bone health check. Upon completing the assessment, the patient is provided with a customised treatment plan, outlining the treatment’s stages, and the best type of dental implants and size are selected.